Gorman the Mad, Gorman2 concept art for Riot Quest/WM. Merc and CG. Concept art of the supreme guardian skorne battle engine. Gastonne1 as a pirate for minicrate. shrine of the lawgiver and the warder with a colossal for comparison. crucible guard army box update. Aduro posted renders of Propero and crucible guard heavy infantry. I probably want at least Mackay. I love the rocketmen and the little robot guy. Is this a new faction, or a Khador off-shoot? The 'jacks look very Khador. Sylvestro reminds me of the guy with the poison grenades from MK1. And to some degree, that semi-mechanical bounty hunter in Necromunda. New faction. They’re from Llael. Love the concept for Master Baldwin and Mister Clogg. It’s another new limited release faction like the Grymkin. A one and done kind of deal. So is there a fluff reason for them using Khador warjacks, or just similar design? I'd assume they are a splinter faction or somesuch! Really really loving that wartrain design! For a steam punk based game its been too long waiting for the train! They aren’t a splinter faction of Khador. They’re enemies of Khador (Khador are occupying Llael, CG are part of the resistance). While the shape is closer to Khador, they’ve also got a bunch of little Cygnar styles in there too. Also that second batch are Lights, which Khador lacks. I imagine it’s just a case of there’s only so many ways to build one of those without radically deviating from the game’s style. you can't tease that without showing photos darn it!! 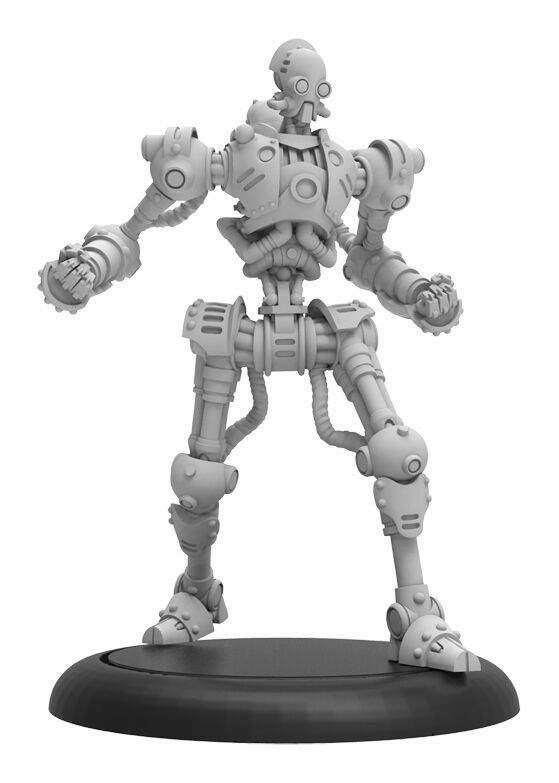 The mechs are hideous like always in Warmachine, but the little guys look promising. I just wish they'd stop adding those huge metal plates on the bottoms of coats, robes and tabards. It is just so painfully obviously impractical. I really like the little robot guy, I'd like to make a Men of Iron army for 40K out of those. It's a paper stand on a 120mm base featuring a Thomas the Tank Engine train meme featuring non family friendly text. Armor designs for those Man-O-Wars remind me of Hutchuck, that Ogrun Bounty Hunter guy that came out a while back. I'm sure I'll pick up a few pieces. I've sadly given up hope that I'll ever get more than 3 poses out of a PP infantry unit though. These guys are essentially what I always wanted out of Mercs. Not sure I'll buy in as I'm happier with Khador/Trolls these days and playing a larger variety of game systems instead of getting more Warmachine factions, but they're super in my wheelhouse. For those not up on the history of these guys; the Golden Crucible is the alchemist organization that invented gunpowder and warjack brains in the setting. They were stationed in Llael and fled when Khador invaded. Gorman and Hutchuk are both members of the organization that became sellswords when things went south. They're to Crucible Guard what Eiryss was to Retribution. The warjacks are actually Tauros chassis jacks, which is the jack you see in Matt Wilson's original IKRPG artwork. They kind of look like an amalgamation of Khador/Cygnar jacks because they're based on the original jack before the faction specific aesthetics were designed. I don’t think I’ve ever looked at a car and not thought yep, that looks like every other car. 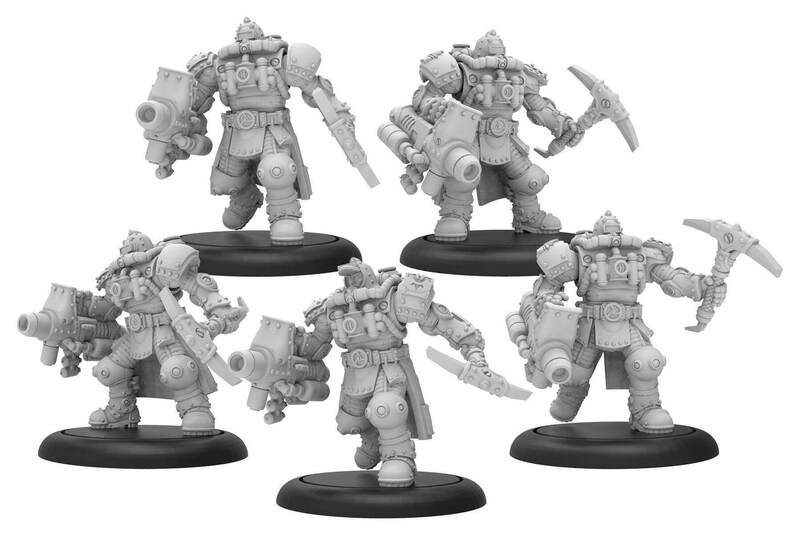 Yeah my first thought on the heavy jacks was "wow they just stole some Khador jacks". There's some different details (4 smokestacks instead of 6, more grill-work etc), but the silhouette is pretty much the same. The train thing and colossal both look like some Dr. Robotnik should be riding in. I don't think I've seen a mini-faction yet that I've actually liked. Well, it’s all based off a single technical innovation, so one would expect only cosmetic differences between the factions. Whilst I prefer GW’s range of looks, there’s fair reason for it in Warmahordes. I look forward to buying the starter set for $10 in 2020. The rocket men might be worth buying sooner, but the rest of the faction is not very inspiring. The colossal is just embarrassing. Great, now I want to watch the farmzoid scene from Spaced Invaders. It's just like how there are a lot of subtle beak variations in finches, and people keep throwing money at Safari LTD for toys of each and every one. Yeah, I don’t see what’s wrong with it? I don't expect a response so leave it alone unless there is one. the CID, so I have faith. Well, to me at least, the unique thing about Warmachine was that it had a core narrative that advanced. Over the last 10 years since I started the game, its advanced quite a bit. To suddenly go back in time and make journeyman versions of established characters that wouldn't have actually used any of the newer historically developed jacks and units just seems like a terribly limited idea, almost like they've run out of room to create interesting jourmeyman casters. The feats, spells and abilities they possess surely could have been pasted onto original sorts without real issue. I just don't see the point from a design point, if that makes sense? It's not like people are going to rush out in large numbers to buy these protocasters because they happen to be younger versions of themselves, right? I actually dig the idea in general (just not for this game), but it just seems really out of touch with what makes warmachine different and unique, while also appearing lazy and uninspired. No offence intended to anyone, that's just my first reaction. It’s for the 15th anniversary, so I guess it’s a throwback to some of the first casters in the game, 15 years ago. Makes sense as an anniversary event certainly. Doing it just to do it would be weird, but I like the idea. It's not like they're not ALSO advancing the narrative. Ice princess locked herself up in a mech suit recently after all, another half abandoned his faction and another still is dead (and didn't get better). Well, for one thing, they can't use their bonded jacks. They don't have feats. They're journeymen. another Cryx Warcaster, but I hope you catch my drift. abilities like Sorscha0 giving Boundless charge to Butcher3). another still is dead (and didn't get better). Still pulling for Severius3 entombed in a warjack or vessel, tbh. Model would just be called : The Highestarch. Ah, see I think I missed that part. That makes way more sense. Maybe they have a busy or minicrate in the works. Here’s hoping! That's what they did for the 10 year anniversary of the Witchfire Trilogy. Seeing the age of that model now has me feeling very very old. No Sorcha preview was shown off? I found this very odd too. Warmachine has a small but loyal following in my region. Eclipsed by other games, but regular events monthly. Nice to see PP finally releasing a new WM faction, but I somewhat wish they would use their creativity for a new side game as well. Something other than mon-poc. Wasn't the last side game that Area 51 board game, that had the name of the PP owner plastered all over it? Or have they released other stuff in the interim as well? It's been a while since I last had a good look at PP. They've not had a ton of luck with the board game side of things. The first Level 7 game is pretty good, but had cardboard standouts in a time where minis were already the baseline from a minis company and that didn't go over well. The second was easily their best and a great dungeon crawler but kind of a crowded market. The third I haven't heard a whole lot either way, but it didn't help that it was XCOM about the time FFG released the official XCOM game. Other than that the big problem is just that they don't have much goodwill in the boardgame crowd. Most of their side game have been super random silly Bodger cardgames that just aren't very good. Zombies Keep Out is actually pretty great, but the Bodger brand as a whole is pretty terrible. A neat idea for a 15th anniversary promo. I kind of wish they'd steer away from reusing the old characters over and over again (I think this is the 4 iteration for most of them). Or at least give us super cool versions of casters which have never had a second sculpt (the Lich lords, the harbinger, Darius, and of course, Colossal Karchev!!!1!!!). It's easy enough to build a list without using the same person for your two caster choices, but having to maneuver around solos is a bit limiting. Especially for factions who don't have generic journeymen casters. i think one caster, plus an 'alt' version is more than enough. I did like that the character journeymen got their own full fledged casters though. I would love too see more like the minion warlock solos as well. Journeymen + unique jacks that come as a single 'team'. guys were around 15 years ago. Darius and the rest weren't yet. Agreed. But how many versions of the same character is too many? I like the idea of reusing characters, but you should be somewhat consistent. It seems like some casters get several iterations, while others don’t get any (not referring to the anniversary in this instance, just so there’s no confusion, just caster remakes in general). Why not just hold the 3rd versions of these casters for the anniversary? Maybe do new versions of some of the prime jacks, or solos? Perhaps resculpts of the widow makers, or the choir, or other iconic prime units? A character unit of the original prime widow makers, or bane thralls would be epic! (Somewhat literally in the PP sense ). Just sayin, I would have liked any of those better than a journeyman I can’t use with 3 of my casters. I think it's because these characters are core to the game and its identity. PP have their issues but they've done a great job of always making narrative model/rules introductions additive instead of subtractive (looking at you Corvus Belli). While not opposed to the idea of them, they seem a bit bonkers on the power level at the moment with the spells they bring with them. Also they’re apparently going to be con exclusives as well I’ve heard. Well, the name "Hollow Holden" has ruined it for me. It sounds like a Twitter nickname. "Hollow Holden can't get over his sister. More like Loser in the Rye. Sad." The miniature itself looks like an older Malifaux sculpt to me. His name has always been Holden and he's a Hollowman. I dont know what else youd call him. Also EVERYTHING looks like a Malifaux sculpt because that game has like a dozen genres in it now. Who is that guy, and why does he have the Crazy Frog on his shoulders? He was a character from a narative Campaign thing they did around the time Grymkin were releasing. I didn’t play that one so I don’t really know the details, just recognize the name. I didn't really pay attention to the story details, but basically, he was just some guy that had been marked for damnation that the Grymkin were coming for. There was a narrative campaign where he grew as a character getting new rules as it went along that culminated in players trying to defend him at Lock 'n Load when the Grymkin came to claim him. They failed and he instead ended up one of the poor souls confined to the ranks of the Hollowmen. Had he survived they would have made him a Merc solo instead. Has anyone done Privateer's mini crate so far? I'm really tempted by the vampire hunter ashley. Are they metal, resin, or both? I believe they're all metal. I know a few people that have done it and quite like it. It seems well worth signing up for even if just for a month if there's a model you really want. Resin/Metal like other recent PP figures. Resin body, metal limbs/weapons. Went in on the first figure. Casting quality wasn't great, but appears to be par for PP standards. Haven't gotten any recently. Depends on the territory. Orders filled by Privateer will be metal/resin, orders filled by Cerberus (European) will have more metal. The recent Satyxis release helped support the 'grass is always greener' maxim. The minicrate stuff has been all metal iirc, except for the first Swamp Siren, which was larger than anything else so far and had the resin body. I’ve been doing the vip subscription as I’ve been playing minions lately and the minicrate figs are all mercs and minions. The Runeball wizard has such a supple wrist! How do you think she does it? Sure casts a mean Runeball! bound to sing or hum along to pinball wizard. It reminds me of Emma Thompson's Captain from Treasure Planet - although without the cat ears, obviously. Manowar Chariots on BAHI. Preorder by May 6 for a trucker hat. Anyone got the subscriptions? I am not sure if I want to get or not. Still on the fence since I never seen anything like this before. I get them. What did you want to know? Is it reliable. Do they deliver on time? Did they ever miss a month or screw up the order and you never got the mini they said they would give? Haven't missed one yet. You get email notice when it ships. I’ve had zero issues so far with quality or missing parts. I do wonder about that myself and how much time they spend double checking or if they make some spares in case they miss something though. There's gotta be a stash somewhere. Totem huntress is amazing in person. Well worth it. P.S. The Huntress is their second resin mini crate fig. She’s got a resin main body with some metal parts to glue on. ...but they like to video themselves destroying the molds to keep the sculpts collectible. Ugh, that actually makes me a little physically sick. What senseless, pointless vandalism. I genuinely cannot wait until 3D scanning and printing make the whole concept of "collectibility" obsolete. I like the concept of the minicrate, but I don't like the exclusivity. Or the fact that there's no way to pick and choose figures afterwards, other than on the secondary market at typically inflated prices. I'm also not a fan of not really knowing what figures are coming further down the pipeline. I really liked that Alton Ashley model,but couldn't justify the cost. I really wanted the hunter too, but by the time I found out about her, it was too late. Not too jazzed by the runeball wizard either. As much as the exclusivity feels like a stunt to make people feel like they have to buy in now, I think its more a result of wanting a way to make things like this without having to support them long term. These fun promotional models are cool, but after a few years they lose their shine when they're offered over and over and the bulk of them piles up. You can really feel this in PP's con offerings and similarly when Wyrd opens up the webstore. It's not ideal, but I get the appeal of being able to promise yourself you don't have to produce these things forever. I'm actually rather shocked at how much agency they've given players to buy in when they want and not turned it into a "mystery box"/"pay now or miss out" kind of thing. I think they've overall doing a really good job with it. True, though I guess that depends on how badly you feel like you need a Gorman pun these days. Personally, PP's collection of cool models I don't own has gotten large enough that something like that doesn't affect me that much. I've also gotten a bit more realistic in general with my shiny impulse buys, so maybe its just a built up tolerance keeping me sane. Cyrenia is a battle field commander of Idrian decent. Based on her rank of High Exemplar, she should excelle in battlefield command and inspiration of her troops. She should be focused on defensive tactical game play. Her feat, Vigilance of the Faithful should allow the army to react to oncoming attacks and is themed around both tactical acumen and divine intervention. Her Battle Plans should further reinforce these ideas. She is not a front line fighter herself but certainly should not be a weak combatant. Hand of Silence is a Reclaimer on a horse. Guiding spirits to Menoth is the primary function of the Hand of Silence. He should be a reasonable combat model while also fulfilling a powerful but niche support role. This is shown through Direct Spirits, Grave Resonace, Soul-Powered, and Strength of Death. The Cinerator Officer brings a plethora of utility options to the Cinerators. Through his Shield Wall order, the Cinerator can become a very durable multi-would unit. Combined with the other defensive abiltiies of the protectorate arsenal this unit can become very difficult to dislodge from scenario zones. With Litany of Fire the unit picks up the ability to remove enemy upkeep spells. Tactics: Take Down is another utility piece to add to the now many options of the unit. The Shrine brings a soul mechanic to Exemplar Interdiction. As the faithful are struck down, more are inspired to join the cause. Returning models to play is an important aspect of the Shrine of the Lawgiver. Path of Urcaen brings additional utility and a unique effect to the army. Ooh. I totally don't need more Menoth figures, but man, I'll probably drop some cash for the Warder and Cinerator. I like that Cinerator too. Kind of a cross between a regular Bastion and the Seneschal, except this time with a fancy cape! I have even less need for Menoth stuff but I'll probably still get one. I'll have to start thinking about whether to paint him in zealot white or heretic black. I'm totally the white knight type, but for some reason Menoth has never appealed to me. The new stuff looks cool though. Looking forward to seeing it on the table. I love Menoth stuff, but unless those minis come out in plastic or resin sans metal, I'm good with what I've got. Resin is probably a good call for the game's generally hulking aesthetic. It's a nice material until you get to small, thin stuff, but I haven't seen how their 10 man units have turned out in resin. I've liked the Medium and up stuff I've put together. The Hand of Silence does not have shoulder pads nearly big enough. He'll probably have no armor rating at all, he's practically wearing cardboard. Render of Iona the Unseen, Tharn Circle Warlock. No, I don't need to start a Circle army. Stop trying to tempt me. Yeah, you don't need Circle stuff Barzam. I just got a bunch to satiate both our needs! That is awesome. I am really disappointed I missed out on that gorgeous model. I am not too familiar with minicrate. Will these new models become available later on? They aren't that hard to track down on the after market, and they average between 20 to 30 on most major selling sites. Iona would make Zangief proud. Hehe is the joke we've all been telling. If she doesn't have at least baseline Stealth, the Circle players will riot. She gets prowl and no pathfinder. I think that might only be in the USA. Ebay UK didn't have any listed for sale - one or two were in the USA but the import cost and postage was making the cost ontop of the model an insane price. I missed out on the Huntress as well and kinda wanted her as well. I don't think any UK stores have bought into minicrate (that I'm aware of). It's a shame and a reason I dislike the minicrate idea - sure it makes a guarantee amount of impulse sales, but its so short term that it harms those who might not afford that month; miss out on the news; or who just aren't even fans at present (or aren't buying models online). I far prefer their limited-edition sale practice of sale only during major convention events. I agree the super exclusivity of it is silly. I'd prefer they set up a Kingdom Death style distribution where they rotate stuff through the store so those who are interested can get them. It's still limited, people who missed out the first time can keep checking for them, still pretty exclusive... I don't know. Whatever, I'm impatiently waiting for all the tin can infantry UAs to hurry up and release! Render of Cyrenia and Cinerator Officer. You left out the new faction’s stuff. So, I think the robot looks cool but I hate that his feet don’t fit in the base and have to sit on the rims. It’s annoying to glue stuff like that. The base looks different from usual. Instead of having the usual recess, it just has some circle cut? What base size was the robot? I remember seeing it in previews, but have completely forgotten. The heavy infantry remind me of firemen. Sadly, not everyone can be as cool as the Khador tin cans. I believe Prospero is on a 40mm. Hybrid Son Of Oxayotl wrote: The base looks different from usual. Instead of having the usual recess, it just has some circle cut? Yeah, that’s just what their bases look like in the renders. I don’t know why they do that unless it’s to hide that they can’t make models that fit within the bounds of them. Wow, both of the exemplars' proportions are pretty fantastically terrible (not that the heavy exemplars have ever been, uhh, exemplars of good proportion). The robot's pretty cute, though. That might be the first one I sub for. I like it better than the original Warlord. I don't want it (not interested in pigs) but that's a really great sculpt! Just makes me still wonder why they have to be fixed limited ranges - such a waste of a great sculpt. Hope a lot of people get to pick her up! Damn it, I knew I should have paid for 6 months up front. I have ordered every mini in this 'wave' so far and now I'll be getting the Warlord too! Brigands are definitely something worth taking 2 units of anyway. Yeah - that's why I find Minicrate to be such bullcrap. I didn't mind when they were just cheesecake variants of stuff. 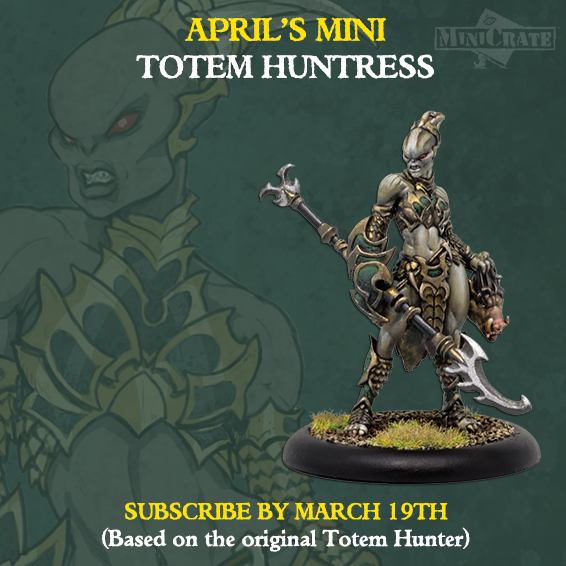 But minis like this and the totem huntress offer nice variety to armies that could use it, so it's beyond stupid to only have them available for a month. Giant waste. I'll be really pissed when we end up seeing a new fellcaller for the Trolls. I hate the bald headed bellower. Such a stupid looking model. I've always wanted a female version done up to modern sculpting standards (or more in line with current Troll's sizes). Give her a hard rocking guitar/ lute, have her throwing up some horns and go let her hang out with Borka and bang some heads. That's part of the 15th anniversary stuff, right? Remind me who else is getting redone as journeymen. Looks good. If I wanted to play Caine I'd be tempted to use that figure for just about all the other iterations. Caine is one of those characters that is a little lacking in his various alternate forms. He's pretty much always just that guy in a coat with two pistols. That's Caine ? Wow. That's disappointing, to me. He doesn't feel special at all. I mean, he looks like a disposable grunt from a warmachine troop. In fairness, its Caine0 from back when he WAS little more than a disposable grunt. Spot the odd one out why not Kreoss? And Stryker, in that case. It’s not just me that’s being hard done by. 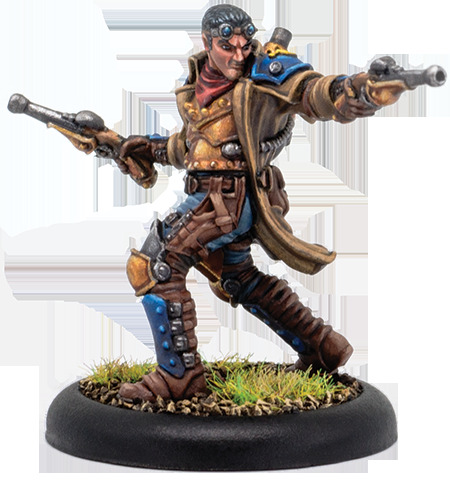 Although there already is a model for Journeyman Stryker, albeit without rules. They were all in prime together. Just as long as Xerxis gets his just rewards come Hordes' anniversary, I can truly be happy... Hexeris just got a resculpt and there's enough Makedas already on the market. Curious how Sorscha will turn out. Deneghra too. We just got a resculpt of her somewhat recently, I'm wondering if the journeyman version will be a bit less corrupted looking. Deneghra's artwork is on page 3 pf this thread, and like the Caine0's model it seems pretty close to the "original"
Are those Jetpack Trenchers?!? This MIGHT get me back into Warmachine if Magnus gets access to that stuff. EDIT: Not Cygnar, Crucible Guard Apparently with the newer Everblight Cav. Those are the Crucible Guard, a new faction (ala Convergeance and Grymkin, a self contained ‘mini’ faction). With some Legion of Everblight thrown in for good measure, no? If those purple Centaur guy are Crucible Guard rather than Everblight then I don't understand nothing at all! Wha...? Another mini faction? That's crazy. Anywhere I can read up on them? EDIT: I see the concepts for them at the beginning of the thread. These dudes are sick. They have a lot of Cygnar look to them too which is interesting. Kinda like a mix between Cygnar and Khador. They're doing a mini faction each year. Such is their stated goal at least. 2 for 2 so far! Plus the 2 they did before they committed to it (Convergence and not technically a faction, but a similar deal Cephalyx). There's been one of these big splash releases every year for the last 4 years. I think it's really cool that they do these mini factions. As long as they have enough pieces to function, they make nice alternatives to the now bloated main factions. As much as I wasn't a fan of the Grymkin aesthetics, it still was an interesting addition to the game. And having the old witch as a dual faction caster was a nice touch. I hope they continue doing stuff like that, as it's incentive for 'main faction fanboys' to pick up some alternative army models, since they already have a caster for it. I'd still love to see more of the mini warcaster/lock solo characters with character beasts/jacks again. I think they're a really fun addition to hordes, and would lend themselves to some really off the wall warbeasts and crazy custom jacks. I was kind of hoping we'd see an upgraded sculpt of 09 since Sorscha's got her new clothes coming. At least with these new themed sub- forces we have opportunities to expand current factions but come up with a "new" army. I'm totally going to try an Armored Korps once the new models drop, regardless of how effective they are or not. Do you mean an 'All Man0war' list with the new sorcha? I've been wanting a Man-0-war centric caster for ever, I'm very pumped about all the Russian Humpty Dumpty upgrades we're getting next month. I would love a 'Colossal' upgrade for Beast 09. With a ungodly HUGE axe! I keep debating on whether to rip my 09 model apart and add his character pieces to my extra 'Extreme' Juggernaut, but I'm hesitant to do it. Heck yeah, reading over tin can Sorcha she's practically begging to try running a pure man o war army. Don't care how effective it is, but I'm totally doing it. 20 points of manowars and mechaniks gets you a free solo, that's not a bad deal. Especially with the fact that the new Tankers are considered Manowar solos. +1 on repair rolls as well, and supposedly each humpty dumpty unit gets advance move as well. I've thought about doing the extreme 09 too. I made a 75pt list with that in mind. Got most everything in, except for the new chariot (which isn't in the app yet), and had to take min units for 2 of the man0war squads. Looks fun, but slow. I have an extreme black Ivan, but he was a bit easier, since he came as add on pieces. Since beast is already a big metal model, I'd have to chop him up a bit. And considering I rarely play him, it didn't seem worth it. I did an Extreme Behemoth back in the day, used the extra giant axe from it for Beast. A thought popped in to my head today regarding the new Khador Tanker units. Are they going to be usable in Company of Iron? Company of Iron says no large based units, but I thought that was more in regards to warbeasts. As far as I know, the Tankers will be the first large based non- warbeast unit. Maybe they'll be an exception? Well, the artillery is not allowed in Company of Iron either, despite the man-sized rule, so I don't think they will get a pass. It's not like the Thumper Crew would be particularly OP at CoI either. All the cavalry units are large based in warmachine* , and the tankers each fight independantly , not as a unit. Does anyone know when the new man-0-war Black anchor battle engines are going to be put into war room? I realize their rules are available, but they're usually so good about having stuff in the app right when it's released. I was surprised they didn't have a card for it in the box. I realize they want you to use the app, as it can be updated if rules change, but I like marking damage on both, as the app tends to crap out every so often. All that being said, the model is great! I pick up the dragodile as well, and it if fabulous also. Possible sneak peak at eilish? A mercenary that came out with the first of the new version of PP magazine, No Quarter Prime. We’re going to be doing things differently with No Quarter Prime in the latter half of 2018, so we are temporarily suspending new subscriptions until we are ready to put our new procedures into place. Stay tuned! Seriously, my gaming group was ALL IN on warmachine, but since the end of MK2 I feel they just can't do much of anything right... I have liked some of their new sculpts more than previous (Dracodile!) although that was a very low bar before... but everything else, man what are they doing?! You guys never saw the Eilish figure? I prefer dynamic updates to GW. Is there any explanation on the No Quarter Prime not allowing new subscriptions? I've been out of the game for a while, but honestly these are something that could bring me back. Not in that godawful colour, though. Are there any other pics of this lot from a different angle? You can see renders here and a few more here. Thank you kindly, sir. Yep, I could be totally all about these. And out next month by the looks. Time to clear the painting table. Including for new model development? A better look at Eilish. I guess Dallas shared this one somewhere? No Quarter Prime is a great redo, but its main problem is that if you don't care about the faction being featured, the issue is kind of a wash. That would largely be okay, but they're also doing a really nice fluff recap, so you wind up picking up issues for that only to realize the asking price is pretty steep when you don't care about all the backstory about the new theme they're working on. New sneak peak just put out by PP. Ooh, that's the female solo for CG, isn't it? I like the look of her. Has the battle box contents for the CG been confirmed yet? If you mean battle box as in the starters for other factions , there won't be one similarly to the grymkins or Convergence. Do we know if the Crucible box is going to be in plastic like the others, or will it go straight to resin and metal like most current releases? I assume resin. The plastic is getting far less common. The jacks are probably still sprue plastic? The details are listed in those links I posted earlier. Basically, everything is metal/resin except for the heavy warjack (Toro/Suppressor/Vindicator), which is listed as plastic (most likely sprue plastic?). Heavy Warjacks, Colossals, and some Gargantuans have been moving to styrene plastic of varying quality. Everything else have been moving more towards resin with metal doodads, and their resin is usually a higher quality. malfred wrote: The jacks are probably still sprue plastic? Yeah the Crucible heavies are sprue plastic. It's funny to think that there was a time that PP thought having everything in metal was not only better, but they'd gloat about 'Full Metal Fantasy'. I'm glad they've seen the error in that, and moved on to doing sprue plastic, and incorporating resin into their models. I actually really like the combination of resin and metal in their figures. It gives them a fair bit of weight, but they're not too heavy, like a completely metal model. I don't know how many times my old Khador warjacks, and space marine drednaughts used to somersault and backflip off of uneven terrain. They are for the plastic sisters. And we've known about stuff like the new titan game, Rogue Trader, the Death Guard, and the new editions to their games a decent amount of time prior to release. Not everything gets touched on, but I think they do an amazing job of balancing the whole thing, considering how much stuff they put out. I don't think that PP has slipped at all, I just don't think they produce the same amount of content. That being said, I've noticed a real distaste for Mk3 from a lot of players. Where as I initially just wrote it off as 'the new ruleset blues', it seems to have continued, and the sort of 'off brand' Grymkin didn't help. I personally think Mk3 is a big improvement over Mk2, and have enjoyed it quite a bit. The Crucible seem to really fit that Warmachine aesthetic perfectly as well, so fans should like that. Metal used to be a lot cheaper, and I still hear people say they prefer metal over plastic because of the heft, so at the time it was a fine marketing approach. PP had missteps with their initial plastic/resin offerings which made me long for the days of "Full Metal Fantasy". I built a Circle army for a friend a few years ago and the resin/plastic/restic or whatever was awful to work with. Their pvc has had problems since day one. Not like, finecast bad, but never as good as one would want and frequently delayed. The resin I don’t really recall any particular widespread issues with, and their styrene has mostly been good with the exception of the Hydra, though not up to GW or Wyrd’s level. I've noticed some models that were metal previously have now switched to resin/ metal hybrids. That was new. Doesn't seem like there was any real reason for it, other than costs I guess. Although their resins have been quite nice from what I've experienced so far. Seen a few Khador models make the switch for sure. Oh, one thing to note, they don’t tend to get resin in Europe. The same models that release in resin in the US get metal releases in Europe. Android needs another update. The cards are in there, but you can't access them. You have to update through the app store/google play. Not sure when it goes live. You have to update through the app store/google play. And that worked, thank you! August minicrate model : Gastonne1...but as a pirate! Outside of losing their collective minds there for a bit in the middle there's some cool stuff in there. Nothing in MonPoc was super noteworthy, but a lot of conformation that we're getting the whole game eventually. Infernals are a great addition long overdue. They're not in the least bit my thing, but they're a thing that's been needed in the game for a while. Not much was announced for my existing factions, but I'm excite to see Skorne get their Immortals fleshed out. It's such an awesome army that's always needed some serious attention to live up to its potential. Infernals have been wanted for ages, it will be great to see how they do them! 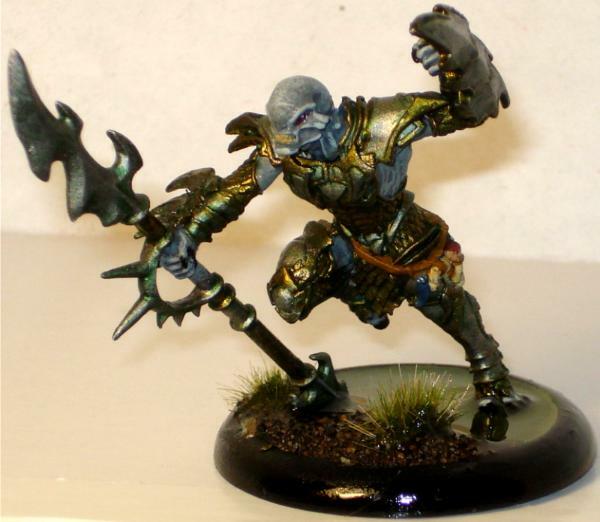 There are/were IKRPG minis for a couple Infernal models going way back (sorcerer, warrior, assassin and... curator? with a little beastie). The design is... different? Which I can sort of appreciate, but they're lanky, scrawny things, that don't really look threatening at all. The concept is really interesting (and there's been a lot of hints over the years- that this is the debt coming due, the souls owed by Thamar/ humanity as a whole for the gift of magic to push out the Orgoth, and their warjack/beast equivalents are made up of an amalgamation of souls they've taken from people who have signed contracts, and those sacrificed to them to fulfill contracts). Personally, despite mark 3 (and subsequent shenanigans against the fanbase) utterly killing my interest in the game, I want to see what they do with them. If they use the old IK sculpts as a baseline, though, I don't see it being engaging from a modelling standpoint. So, yeah. Hope they move away from that, as the curator is the best of a bad lot. As far as the Fires of War video goes... that is the most boring and uninteresting narrator I've heard in a while. And the Keynote was...a little sad? The audience didn't seem really engaged (or very big), at least not compared to past years I've seen. I’m pretty excited for Infernals. They’ve always intrigued me. Was there any news about novels they have planned? Figures they'd finally do Infernals several years after I stopped being one. Yes. Dawnguard CID will give them a freaking tank. That and the Immortal CID i'm looking forward to the most and already the wait is paying off. They call it a flying tank, but it just looks like a car to me because of the wheels on the sides. Was that giant Skorne statue they mentioned supposed to be warbeast or gargantuan size? The video said Battle Engine so I guess halfway between a heavy and gargantuan? Do we know if the Infernals will be a limited or full release army? I'm going to assume the former. I assume it’s just next years limited army. The more I look at it, the more hilarious it gets. I'm really liking those new Tharn. I may have to be bad and buy them for Paleo Diet. Anything that makes the existing tharn units better can only be a goodthing. Anyone see the video for there new skirmish game coming called Riot Quest. Looks like post apocalyptic Immoren! Got a link? Is this something PP is putting out? Ok....... not sure what to make of it beyond horrible flash animation. PP jumping in the arena game craze ala Shadespire and Aristeia ? Yup, that's pretty much what it is. allowed it to place a friendly faction model that it passed near. I think the grav tank looks awesome, can’t wait to see the final model. I'm going to guess the new tank will be a part of the Dawnguard CID or the next Ret release at least. 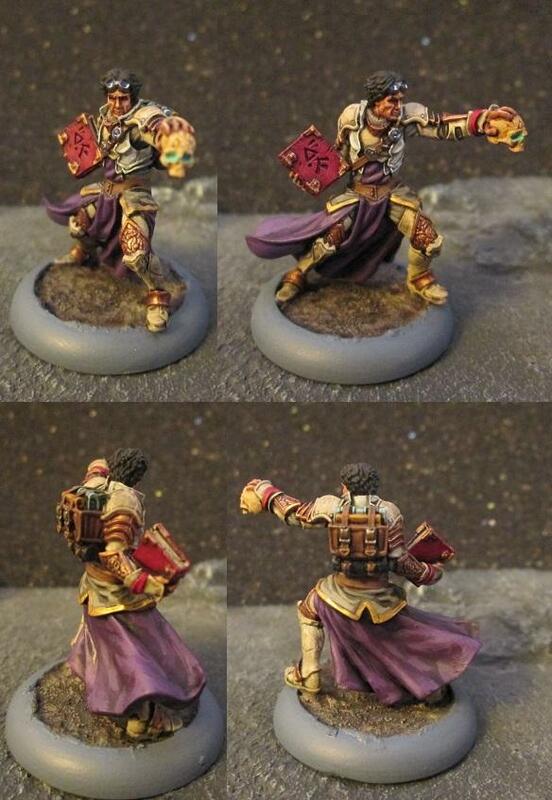 From facebook: Eiryss minicrate model. I forget which month things fall on. I wish I had a reason to buy that because it looks awesome! Another serious take on a mini-crate model that makes me baffled that they'd throw away the casting from such a fantastic sculpt! I really like how PP has been 'expanding' on themes within the factions. Such as the recent Man-0-War stuff for Khador, and these new Tharn models. Its fun to see them go a little deeper with certain pillars of these particular armies, and I hope they continue to do that. It seems people are pumped about the Infernals. I remember the old RPG minis, so I'll be interested to see what they add to them. I assume they'll be a hordes faction? Would it be considered 'Jumping the Shark' to bring back some Orgoth as a faction? I don't know what the deal is with them, but I remember thinking about them coming back during the release of Escalation. I'm guessing they would be a Hordes faction, as they seem to not get/like Warjacks. Do you think they'd ever consider making existing hordes factions with Warcasters/warjacks, and vice versa? It seems like you could fairly easily add warbeasts and Warlocks to any warmachine faction, as the beasts can really be any new kind of animal you would want (well, might not work as well for Convergence...). But with Hordes, there's only a few factions I could see having the ability to use/maintain warjacks. Trollbloods, Piggies, Possibly Everblight. But Circle and the Skorne seem unlikely. Especially since they already use Wood/Stone constructs in their armies. People don't have to buy 2 rulebooks, just 1, so there's no financial pressure there. Good god Riot Quest looked like childish drivil. Or maybe an 80's cartoon that didn't get greenlit. UGH. Avoid. The Infernals are a Warmachine faction. I guess they’ll be like Cephalyx, where they don’t have Warjacks but they don’t use the Fury mechanic so they’re Warmachine. Supposedly the Infernals will use neither Fury nor Focus. I could see them having a heavy reliance on Souls as a power source given their fluff. Souls would be tricky as that would imply that they can only gain power by killing; a neat mechanic but one with issues since it would mean that the only way to get the army rolling out its powers would be to have already killed a number of the enemy; which implies that the army must already be working. It would also have serious problems against armies with more beasts/machines and less troops or against forces taking a lot of heavier troop types (and thus fewer in number); whilst against an army of spammed warriors it would have an unfair advantage. Instead fury, focus and the wind-up that Convergance use are all internal to the army itself. Whilst they are influenced by the enemy, they don't require the enemy to generate power to use. Therefore they work equally well against any type of opponent. I could see them working with souls if they have their own units to sacrifice, but then again if the whole army revolves around putting modles down and then removing them it might not be as fun to play if you're taking half your own models off the table. Infernals have been collecting Souls for some time so I could see them starting the fight with some and/or a battery to draw from, but then having to collect some more to maintain momentum. Opponents who bring few troops could be a problem, but they’re also hindering themselves in Steamroller where you’ve gone zones that can only be held by units. PP makes bafflingly poor decisions way too often. A few of the Lesser Warlocks work for Warmachine factions. Rorsch, Wrongeye, etc. On the flip side, Ralluk is a Trollkin jack marshal that works for Hordes that lets you take Merc jacks with them if you really want to. Wow! I've NEVER heard that. And I've been playing Warmachine since 2004! Crazy if true. 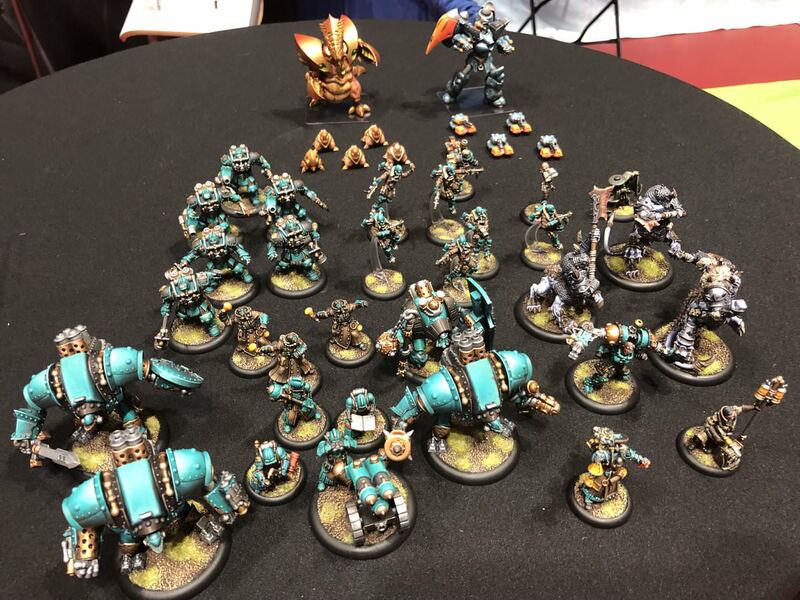 I guess I assumed that if Khador had Warlocks, they'd be Warmachine models, since they'd use Warmachine troops, but, this would certainly cause a debate at PP HQ. Moopy wrote: Or maybe an 80's cartoon that didn't get greenlit. Yeah, I went back and watched the Keynote after writing that. Should be interesting to see how they do it. I thought the two Wills were great live in the Keynote BTW. Which is strange, because the Monsterpocalypse video is just SO full of transparent excitement. Too bad, they're a good team. I have all of these guys, and I LOVE them! I really wish they'd do more of the Lesser warlocks, as they were really fun, and (at the time) had very unique beasts, which was cool. Would love to see more of them, with even WILDER creatures. (why is there no Minotaurs in Caen?, they have almost every other man-beast). And lesser warcasters like Ralluk, would be fun, especially if they had unique weird jacks that added some interesting stuff to the game. And lesser warcasters like Ralluk, would be fun, especially if they had unique weird jacks that added some interesting stuff to the game. With the official launch of the Tauros, I keep hoping we'll get Rex and Rutgar Shaw as something similar to this in the future.